The art toy journey of Clark Rotharmel, who has used the aliases ClarkR and Clark’s DayDream Studio, truly began in 2008. Not only was that the year he interned at Hasbro’s Model Shop, assembling working prototypes and hand-painting models for the G.I. Joe, Transformers, Star Wars, and Marvel design teams, but he was also preparing to receive his Bachelor of Science degree in industrial design from Wentworth Institute of Technology the following year. And, of course, 2008 is also when Rotharmel created his first hand-modified designer toy piece, DayDreamer, the popularity of which led to a variety of iterations. Titled DayDreamer, the above-pictured piece was Rotharmel’s entry into The 2008 mini Munny Custom Contest. Embodying what would become his well-known aesthetic, the exterior of the art toy’s form had minimal paint applied to it, Rotharmel’s artistry focused on creating a diorama-like scenery inside the piece’s head, revealed through the use of a clear plastic dome. The intricate and technically precise end result implies that DayDreamer is imagining himself standing on a grassy field, flying a kite on a sunny day. This effect was created by talking a 4 in. tall Mini Munny and removing the upper portion of the head, replacing it with half of a do-it-yourself Christmas ornament. For the playful scenario enclosed within, Rotharmel utilized a Munny Zipper Pull‘s figure for the tiny character, sculpting and decorating the remainder by hand. That year Kidrobot released two 3 in. tall Dunny blind boxed series, the Fatale Dunny Series and Dunny Series 2010. Included within these, respectively, were pieces by Alexandra Anderson and Damarak the Destroyer (Damara Kaminecki). The Anderson design provided the micro-sized Dunny rendition, while Kaminecki’s piece — once the factory paint application was eliminated with nail polish remover — became the perfect clear external shell. In 2011, to satisfy the continued demand for the DayDreamer Dunny, Rotharmel decided to do a second edition of twenty pieces. Titled the Blue DayDreamer Dunny, the sole differences were that the exterior of the form and the micro rendition within were painted a sky blue tone. And the above-pictured DayDreaming in MunnyWorld was also created in 2011, being Rotharmel’s entry into the MUNNYWORLD MEGACONTEST. Revisiting the 4 in. tall Mini Munny form, this rendition depicted a cloud pattern across the outer shell — an aesthetic which Rotharmel would later employ on his FlyingHigh series. The Summertime scenario on this version was far simpler in appearance, the reasoning being that zipper pull-sized Raffy and Munny figures could be interchanged under the removable dome, these characters held in place by hidden magnets. Rotharmel made a second unique Mini Munny in 2011, the Happily Haunted DayDreaming piece for the Tales From the Sneaky Crypt exhibition at Kidrobot’s London location. Once again forgoing an intricate landscape, the focal elements here were the alterations to the miniature black forms: the Munny gaining pointed ears and wings, the Dunny pieces reimagined as flying bats, and the accompanying pumpkin piece topped by a Trikky with an especially long tail. Revisiting this Halloween-themed concept in 2013, Rotharmel created ten Happily Haunted DayDreamer 3 in. tall Dunnys. Decorated with glow-in-the-dark green and UV reactive pink paints, each of these had a single “micro”-sized, bat-winged Dunny suspended within it. Packaged randomly within specially made coffin-shaped containers, nine of the pieces had green on the exterior, pink on the interior, and came with a handmade glow-in-the-dark pumpkin accessory. The remaining piece in the edition was a unique rendition, inverting the color placements and coming instead with a modified “black cat” Trikky companion. Returning to 2011, Rotharmel released his third DayDreamer “cycle” at the end of the year. Building off of the seasonal evolution the concept undertook, these 3 in. tall DayDreaming in a WinterWonderland pieces incorporated the illusion of a snow-coated interior. A one-of-a-kind version of this design (above left) was commissioned by a private collector, the “micro”-sized Dunny inside wearing a scarf and pulling on a tiny sled, carved from a popsicle stick with painted paperclip runners. The other version (above middle and right) was handmade in an edition of five, featuring the “micro”-sized Dunny modified in the likeness of a snowman. The following year, Rotharmel remade the DayDreaming in a WinterWonderland concept on a Mini Munny form. Featuring the same metallic “candy red” paint application to the exterior as the previous renditions, this one-of-a-kind work transformed a Zipper Pull Munny into the likeness of a scarf-adorned snowman, with the frozen pond being cast in clear resin for a more realistic appearance. Unfortunately, this piece was never displayed at the Sneaky Snow Ball exhibition it was made for, as it didn’t arrive and was thought lost in the mail; though, ultimately, it was located and returned to the artist. And while Rotharmel was best-known for his DayDreamer series, he would create another notable thematic line — FlyingHigh — which will be discussed in the second part of this article. 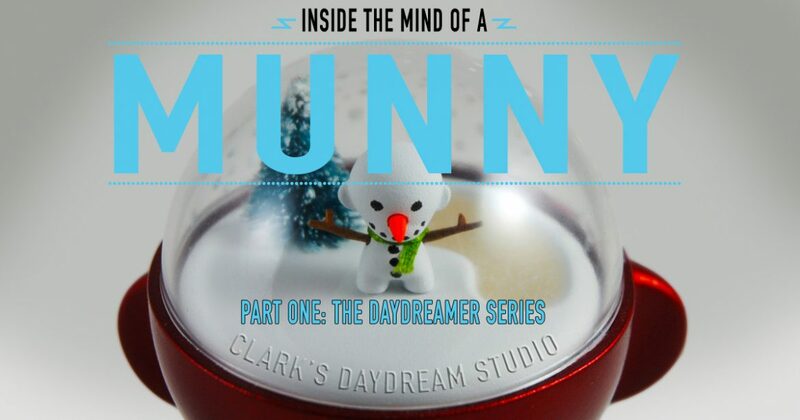 Continue on to Post 2 of 2 in the series “Clark’s DayDream Studio : Inside the Mind of a Munny”.